Follow the route of the Vikings on an expedition cruise from Greenland, across the Arctic Circle, along the rugged shores of Labrador and finally arriving in Newfoundland. Discover dramatic landscapes along the way, from glaciers and icebergs to the tallest mountain peaks east of the Canadian Rockies. Enjoy land excursions by zodiac at every opportunity, with opportunities to hike, watch for wildlife, and visit local communities. The comfortable Ocean Endeavour 1B ice class ship and a high number of crew to guests provides a seamless and exhilarating expedition experience. Visit the only authenticated Norse archaeological site in all of North America. Walk through reconstructed dwellings and interact with Viking interpretive guides that bring history to life. Very few people have the chance to visit the gorgeous fjords and hike amongst the mountain peaks of Torngat Mountains National Park. Discover landscapes alight with autumn colours and watch for wildlife along the way. Meet the hospitable people who make their homes in the far north. Greendlandic communities and Inuit communities provide a warm welcome with the chance to learn about local games, art, and handicrafts, food and music. Your adventure begins in Canada's largest city, Toronto. Prepare for a dramatic change of pace when you travel north to Greenland tomorrow. An orientation meeting at your hotel will get you excited for your expedition. Toronto has so much to see it is worth adding time to explore before your expedition. Overnight at the Sheraton Gateway Hotel. This accommodation is conveniently connected to Terminal 3 of the Toronto International Airport via a climate-controlled walkway. The hotel features a fitness centre, business centre, indoor heated pool and whirlpool, and on-site dining. Enjoy peace and quiet before your flight, as all guestrooms are equipped with triple-paned windows. Join your expedition group on a charter flight north today. Depart the big city of Toronto, Canada and fly to Kangerlussuaq, Greenland. Travel along Greenland's longest road, which is less than 20km (12 miles), before traveling by Zodiac to board your cruise. Excitement builds as you sail into one of the longest fjords in the world, Sondre Stromfjord. This outside cabin features picture windows with unobstructed views, a matrimonial size bed, sitting area and a private bathroom. Located on deck 5, enjoy approximately 270 square feet of room to relax along with a flat screen TV, refrigerator, hair dryer, bathrobe, and bathing amenities. Follow in the footsteps of Leif Erikson as you travel from Greenland to Newfoundland. Pass by fishing villages, islands and waterways as you explore the west coast of Greenland. If you are lucky, the lush vegetation and tundra foliage may be changing colours for a stunning landscape. Enjoy an expedition stop to explore the wild landscape. Add-on a kayaking program to explore the marine environment in a quiet and fun way. Paddle through serene waters and get closer to the natural environment and wildlife. Enjoy at least two kayak excursions throughout your expedition. Greenland's capital of Nuuk offers shopping, cafes, and restaurants with a European flair. Learn about one of the most northernmost capitals in the world as you explore Nuuk today. Look for an interesting mix of colonial Danish architecture and modern buildings as you explore the downtown core. The Greenland National Museum in Nuuk is a must see destination. Sail south over the Arctic Circle. Greenland's coast is spectacular with dramatic mountains and glaciers. Follow the path of the Vikings as you sail westward across Davis Strait, the entrance to the Northwest Passage. Watch for the abundant marine animals and seabirds that call this area home. Immerse yourself in the environment with onboard presentation on archaeology, history and culture. As you come to shore you may experience some of the largest tides in Canada, nearly a match to the Bay of Fundy. Discover Québec’s Inuit region of Nunavik as the expedition makes landfall in Canada. Discover the Inuit community of Kangiqsualujjuaq, where you have a chance to mingle with local folks. Watch for the George River caribou herd which has its calving grounds nearby. Explore Torngat Mountains National Park, the only park initiated and staffed entirely by Inuit people. Canada’s highest peaks outside of the Rockies are found in Labrador’s Torngat Mountains National Park. Explore the area with the Inuit of Nunatsiavut who will guide you through their spiritual homeland. The landscapes are alight with fall colours as you search for wildlife in the Torngats. Continue to explore Torngat Mountain National Park today. Keep watch for polar bears, caribou, falcons and eagles – just some of the many species you may spot on land. There is also a large marine mammal population in the area which may splash by. 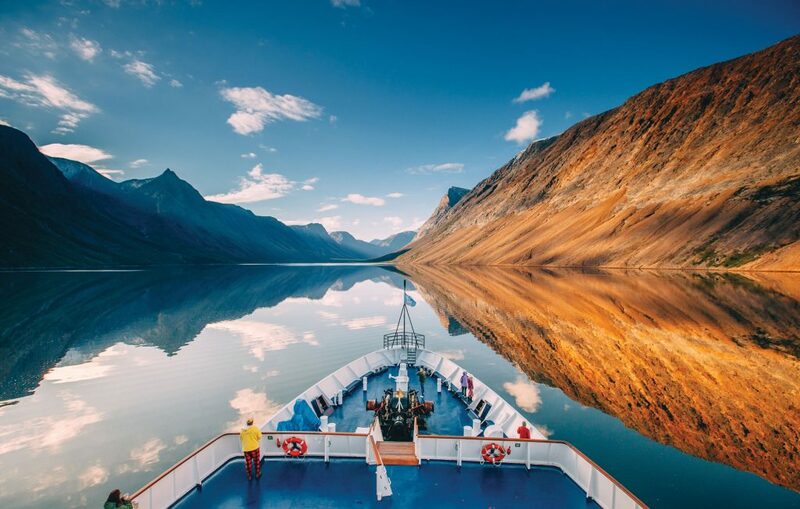 Travel in the Torngat Mountains is unbeatable with gorgeous fjords and plenty of wildlife. Very few people are lucky enough to step into Torngat Moauntains National Park. Continue to explore with guided hikes through the dramatic landscape in search of wildlife and archaeological sites. Exploring by Zodiac also provides a unique shoreline view. Continue to journey south along the Labrador coast, stopping at cultural sites along the way. Discover an abandoned mission from the 1830s and learn about the controversial history of the site which was abandoned in 1953 and forced the relocation of the local Inuit community. Former residents continue to visit the site and hunt and fish nearby. Few Canadians have been to Labrador, let alone Nunatsiavut. Enjoy an unforgettable opportunity to meet the local community. Enjoy a warm welcome in the busy harbour village of Nain, set in a gorgeous location. Visit a beautiful Moravian Church and expect music, food and handicrafts for a full immersion into this community as you explore the area with local experts. Explore the Labrador coast by land and sea. On board presentations add a unique immersion to the experience. Explore the varied region of the Labrador coast. This unique region offers coastal barrens, high subartic tundra, high boreal forest, mid-boreal forest, and string bog. Explore the beautiful landscape of the Mealy Mountains. The pristine landscape of the Akami-Uapishkᵁ-KakKasuak-Mealy Mountains National Park Reserve are an adventurer’s playground. The rounded rock summits of the Mealy Mountains tower 1180m (3871ft) over Lake Melville. The traditional Labrador Inuit name of the park means White Mountains. Arrive at the northern tip of Newfoundland just as the Vikings would have landed years ago. Discover the only authenticated Norse settlement in North America, with remains dating back to 1000 AD. Visit the interpretive centre and learn about Viking history in North America. Discover the charm of the local Newfoundland people as you venture into the Terra Nova National Park. Explore Canada's most Eastern National Park. This amazing region has attracted people for at least five thousand years. Rich in resources, the park land also contains several communities and sawmills. Your adventure comes to an end today as your cruise arrives back in St. John's. Savour the final day of your expedition as you sail back into St. John's Harbour. Say goodbye as the expedition team assists with your onward journey. This outside cabin features a porthole window with unobstructed views, two lower berths and a private bathroom. Located on deck 4, enjoy approximately 100 square feet of room to relax along with a flat screen TV, hair dryer, bathrobe, and bathing amenities. Adventure cruising is unpredictable. Expedition staff may adjust the itinerary and inclusions to accommodate to weather to provide the best possible experience. This trip is available for departures in September. based on double occupancy, September 2019 departure and our base class.